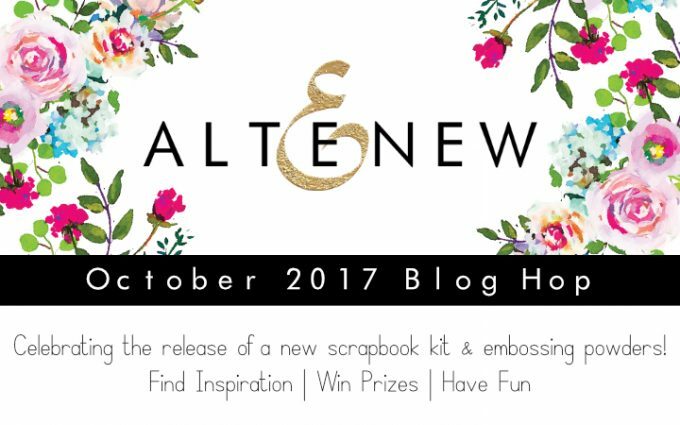 Hello and welcome to Altenew October 2017 Release Blog Hop. We are releasing new embossing powders and Scrapbook Collection! You probably came from Terhi Koskinen blog. If not – you may consider starting from the beginning at Altenew Scrapbook Blog and see what other members of Altenew design team and guest designers sharing. And as always you have a chance to win a prize. 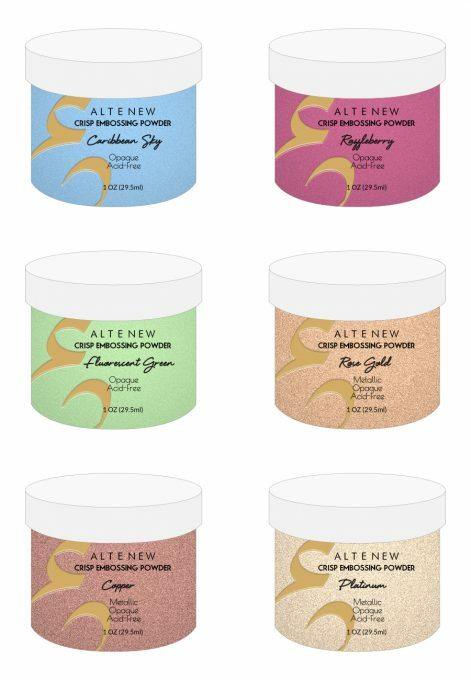 If you like embossing new Altenew embossing powders is something you may want to check out. There are tree metallic colors: Platinum, Copper and Rose Gold as well as three color: Caribbean Sky, Razzleberry and Fluorescent Green. I made two cards using new amazing embossing powders. I’m totally in love with new Platimun Embossing Powder. It had this kind of light vintage and noble shade, perfect to elegant or luxurious cards. To start off I die-cut a Leafy Garland and cut it in two pieces. And heat embossed 4 layers of Platimun Embossing Powder on each. I was simply inking the whole die-cut with Embossing Ink and covered with the powder. Using several layers of powders turned paper die-cuts into faux enamel embellishments. I did the same with the word congrats from Script Words Die Set. I cut a panel out of Navy cardstock and sprinkled it with water using Distress Sprayer, added embossing powder right away and heat set it. I adhered my platinum embellishments onto the panel and foam mounted it onto a Pale Gray card base. For my second card I used very beautiful and juicy Razzleberry Embossing Powder. First onto a white panel I heat embossed Wood Pallet Background using this powder and inked it over using Razzleberry ink. I like the tone on tone look these two created. Next I adhered the panel onto a white card base. I stamped and die-cut floral elements using Golden Garden Stamp and Die Sets. Along with stamping and die-cutting the sentiment using Halftone Hearts Stamp and Die Sets. I will also randomly choose a winner from comments left on this post and the prize will be $30 gift certificate to Altenew online store. Please leave a comment on this post by Wednesday November 1st at 11:59 PM EST for a chance to win. I will announce the winner here in this post on Thursday, November 2nd. Important notice: I’m changing the way I announce giveaway winners. Before I did it ON THE BLOG HOP POST and emailed a winner instructions of how to win a prize. And I will do so in future. But recently several times I had issues updating my blog post so decided to also list winner on a winners page. The winner of $30 Gift Certificate to Altenew online store is Dawn Jones. The next stop in the blog hop will be amazing Sandra Dietrich. If you got lost, please go back to Altenew Scrapbook Blog. I love your berry colored woodgrain background! So vivid and bright! Such a beautiful projects! I love the gold against the navy on the first card and the pink on the second! Gorgeous designs Svitlana! 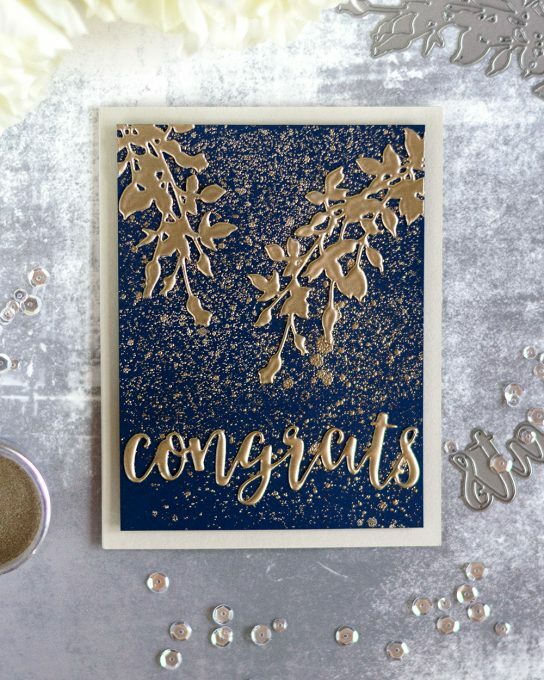 Love the blue and gold elegance and the playfulness of the Razzeleberry ink with the wood grain embossing, thanks for the fabulous inspiration! Have a wonderful day! Very pretty cards! Love all of the new embossing powders. Beautiful cards. Love the new embossing powders. Thanks for sharing..
Great use of the embossing powder. Stunning cards! Especially the navy card using the platinum embossing powder – very powerful. The monochromatic look for the razzleberry is inspiring! Gorgeous cards! I love both of them, the color of the Razzleberry ink is so beautiful and the other one using the platinum embossing powder is just WOW! I love the embossing powder “sprinkles”! Thanks for sharing your talent and inspiring us! Lovely cards! But that navy with the new platinum EP is so striking! Woodgrain is a great idea too fir tone on tone! Brilliant! WOW!! Gorgeous cards!! I can’t wait for these powders so I can create similar art with my dies and stamps😁! Can’t wait to see them in person….that Razzleberry overtamping is Fabulous….Thanks for the great ideas! I am still working on your masking class, I just got my liquid masking fluid and freezer paper yesterday so I will be watching the lessons again and using your techniques. Thank You!!! I am in love with the first card you did with the four layers of embossing & the way you created the background. I had no idea you could spritz water, sprinkle embossing powder & heat set. Thank you Svetlana for teaching me another new way to create while making a card for someone special. Beautiful cards and another great release from Altenew, can’t get enough of their flowers! Your cards are exquisite. 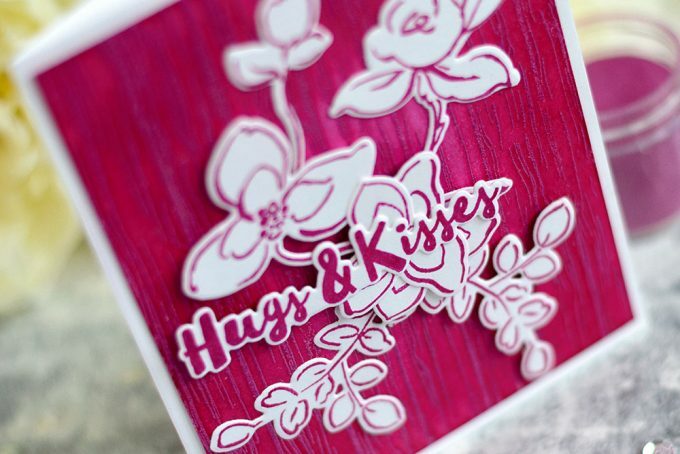 Love the embossing powder and the results you achieve using them. I love your raspberry card!!! Love the bold colors for your cards. The woodgrain background on the pink card I especially like. Svitlana you always do the most amazing things with the new release products… which can also be a bad thing, if you know what I mean! LOve the navy with platinum – WHO KNEW you could use water to heat emboss????!!!! both beautiful! Very pretty cards. Love the monochromatic look of the pink one. Both backgrounds are so eye-catching! I love the gold embossing!! I didn’t know you could use embossing powder on top of water. I learned that from you today! Your designs always leave with my mouth open in awe! Love your cards, the backgrounds are beautiful and that razzleberry is gorgeous! Both cards are very beautiful, really love that gold! Wow! These cards are beautiful using the new embossing powders. Love the designs and the colors on both! Absolutely gorgeous!! Love this release! Gorgeous cards, Svitlana! The layered gold embossing against the dark background is striking! Beautiful cards. I like the faux enamel on the first one. LOVE your cards – you have such a fresh approach – elegant, bright and cheery – you do it all! Your uses of the wood pallet background has made that stamp a MUST in my studio. Thank you for sharing your talent and inspiration. I recently subscribed to your blog and I am absolutely hooked! Beautiful cards! The embossing powder looks amazing, it is top of my list. Beautiful cards! What fun new products! Love the razzle berry cared and the other one is great too. Beautiful cards – I especially like how you did the backgrounds. Think I’m in love. Great kit. Beautiful cards. I had know idea that you could use embossing powder after spritzing. Thanks! Those embossing powders are just beautiful! I LOVE the first card, with all those layers, so beautiful! Love your cards – stunning! This is a great release and I love the colors of the embossing powders. Thanks you for the great tip, spritzing water before sprinkling the embossing powder – a great look. Beautiful cards, the navy and gold is so elegant. The new embossing powders are gorgeous! I love how smooth they melt. Beautiful cards! Gorgeous and unique card designs!!! Wow your cards are sumoly gorgeous. When i scròlled down and saw your first card i actually said “thats gorgeous’ out loud. Hubby looked at me ss if iveas mad AGAIN!! Ha he doesn’t understand the talent you have….i do. Thankyou. They are gorgeous and very elegant too! Stunning cards! Looks like I’m going to be getting some new embossing powders! I’ve never seen the woodgrain embossed in red…..awesome look! Thanks for the inspiration. Perfect background for the vines and sentiment! I love your cards Svitlana. Your designs are always bold and beautiful. I love the substantial embossing on the first card… so elegant. Stunnning Platinum embossing, colors and designs. Gorgeous cards! I especially love the deep blue with gold embossing! Both cards are so beautiful! I was eager to see those embossing powders used & your cards really show them off. They are on my wish list right at the top! WOW Svitlana, these are just amazing, the rose gold EP looks so “silky’ and beautiful. Both are great, esp. the bue/gold one! Beautiful cards, love the embossing and the beautiful shade of pink really compliments the latest kit. The colours in the kit are gorgeous as is the embossing powder. Would love to have one of these kits to work with. OH how beautiful are these?! Love what you did with the embossing powders! These new embossing powders have my heart racing! Beautiful! I placed my order at 12:00 am this morning for them so I wouldn’f Miss out on them and as soon as my deposit cleared I ordered the Mini Rose stamps, tape runners and the Vintage roses inspiration booklet! So excited to get these! TFS? Thank you for showing the how you used the new embossing powders. It’s helpful to see the colors on a real project and I love the colors you chose. Lovely cards. Especially the pink with the new raspberry embossing powder. Thank you for sharing. Just Stunning! I love both of these cards, they are so beautiful, That embossing is just so pretty, I have always loved embossing, it just really makes a card “pop” I think. I always love everything you create. I love the new raspberry embossing powder! How beautiful. I also love how smooth the gold powder looks when multi-layered. Beautiful and elegant! I am most intrigued by the splatter effect on the navy card–I had no idea you could do that!!! Thank you so much. Your cards are so lovely. Thanks for sharing these embossing powder techniques. The platinum embossing on the navy card stock is just gorgeous. And the razzleberry is amazing. I love the embossed card! Absolutely beautiful! So nice to see card ideas for this kit. 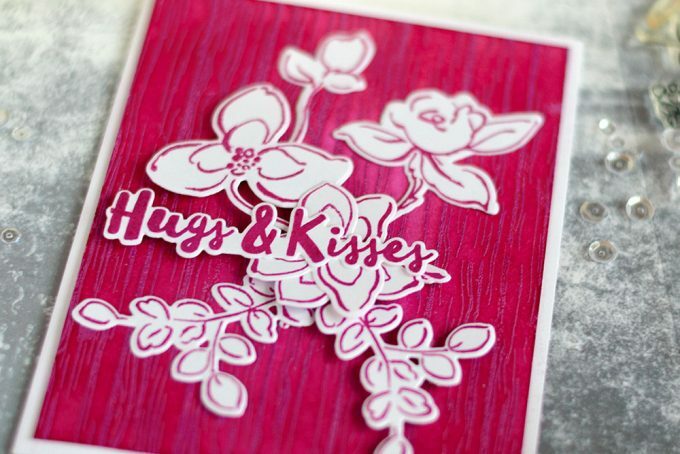 The embossing colors are beautiful and your cards showcase them so well. Nice to see monochromatic cards! Love the embossing. I am loving the new embossing powders, especially the metallics. 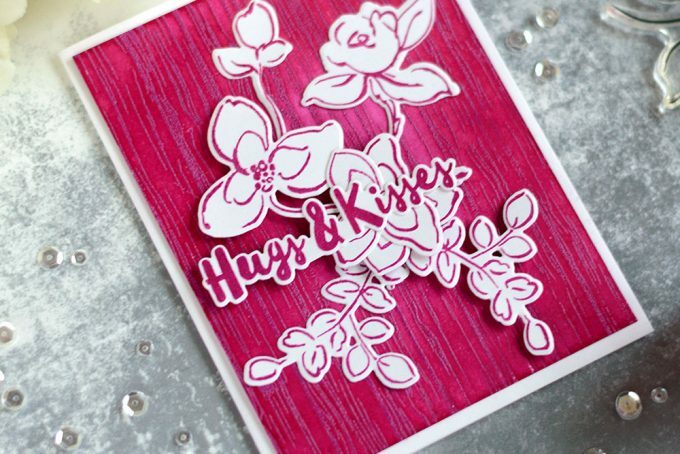 Your layered embossing effect on the first card is GORGEOUS!!! I will definitely give that a try. TFS your talent and inspiration. I ordered the metallic embossing powders first off! Love the colors of the first set, so I got right on it!! Beautiful cards! I love how you created those backgrounds! Beautiful embossing. I love working with embossing powders. Thank you for sharing. lovely cards, Svitlana – the new colors of embossing powders are so pretty! Love the gold embossing on the blue card! Thanks for sharing! Beautiful cards and use of monochromatic colors. Truly enjoying the vast talents on the blog hop. Beautiful cards! Just love those new embossing powder colors! Simply stunning cards. Loving these colors. GORGEOUS use of the new embossing powders! Gorgeous cards! Love the embossing powders… fabulous colors! Темно-синяя с золотом – это конечно просто зрительный оргазм! Потрясающее исполнение, и столько объема и текстуры!!! Elegant cards. Beautifully put together Svetlana. You have a gift. Thank you for sharing. The new gold embossing powder is gorgeous! I need to get my hands on a container of it pronto! I’m not usually drawn to jewel tones, but your cards are so pretty, especially the dark blue paired with the gold. Really pretty! Both of your cards are stunning !!! Beautiful cards, LOVE the platinum EP, so rich looking with 4 layers on your card and the razzleberry EP card is stunning with the flowers on the wood pallet background. Love the idea of embossing the die cuts to make “metal” embellishments! Brilliant. Gorgeous cards! I agree that Altenew’s platinum embossing powder has a beautiful vintage tone. I didn’t know you could use water to stick ep but I will definitely try this. The Razzleberry ep also is so rich and lovely. Another great release! Very beautiful cards. The new embossing powders are so rich and luxurious looking! COOL embossed background! Very excited about the new embossing powders in this release! 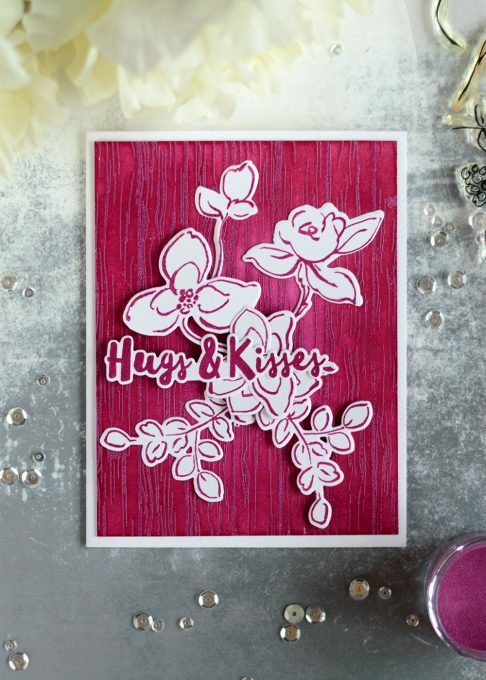 Love how you used the embossing powders to make such AMAZING cards. Love the gold flecks on the black. The wood grain on the red is great. The tone on tone wood background is truly striking. Love it. Such vibrant cards – love the embossing (one of my favorite techniques). 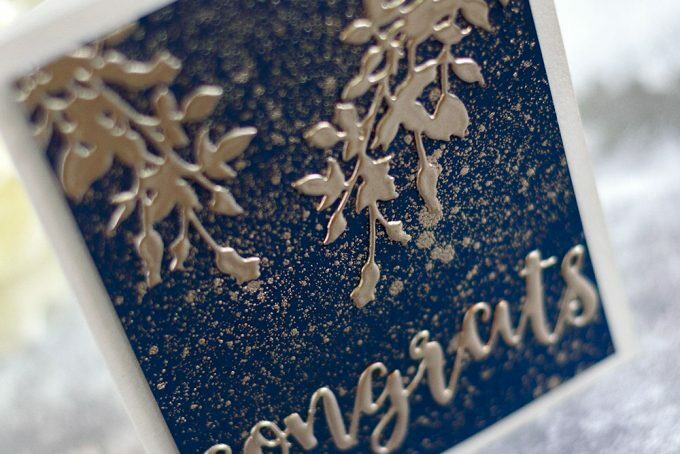 I love, love, love, love how embossing makes a card look so elegant and rich. Your first card is amazing! I love it! I love how embossing works and how it looks. Who ever thought you could use a heat gun to make a beautiful card? Certainly not me. The second card with the background of wood paneling and Razzleberry is so nice looking. I am in love with both cards. I’d love to make a card like yours. When I win something, then I can buy the new embossing powders and some of the new paper. Thanks for showing us your beautiful cards and for giving us the chance to win something. Off to the next person on the hop! 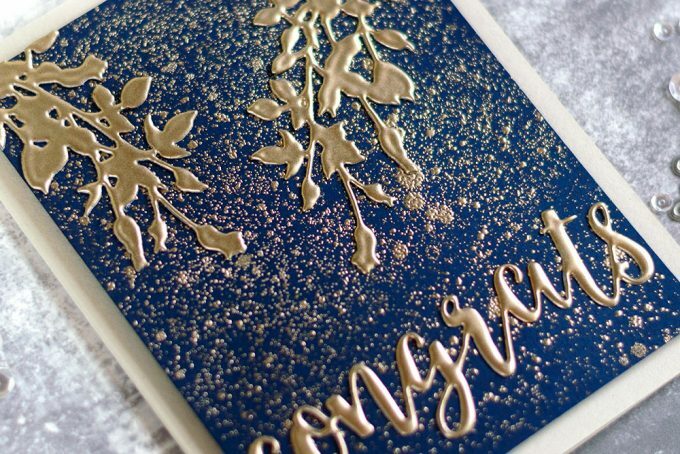 The embossing makes these cards look so rich and elegant and I really love the shiny gold! I love the gold with navy background. I think I might try this idea with rose gold! Wow! Your cards are gorgeous! I have only used embossing powders for small accents, but your cards inspire me to try something new. Thanks for sharing! Love your gold embossed card. It’s so rich looking. These are two really stunning cards ! Stunning cards! Love the gold embossing. Beautiful cards. Those embossing powders are stunning. Gorgeous simple cards! I love the backgound on the second card..stunning! Wow, your cards are stunning!! I’m going to have to try what you did with the water and embossing powder for the background on the first card. Love the look of it. So much texture! . I also love the background on your second card. Gorgeous! Wow, your cards are gorgeous! I especially liked the blue one with the platinum embossing powder, so Beautiful! I have never heard about the technique you used were you sprinkled water using Distress Sprayer, added embossing powder right away and then heat set it. I will definitely try it. Stunning embossing powders! Great projects. These embossing powders are gorgeous and the cards you’ve made with them are beautiful! Also love the family-based scrapbooking collection. 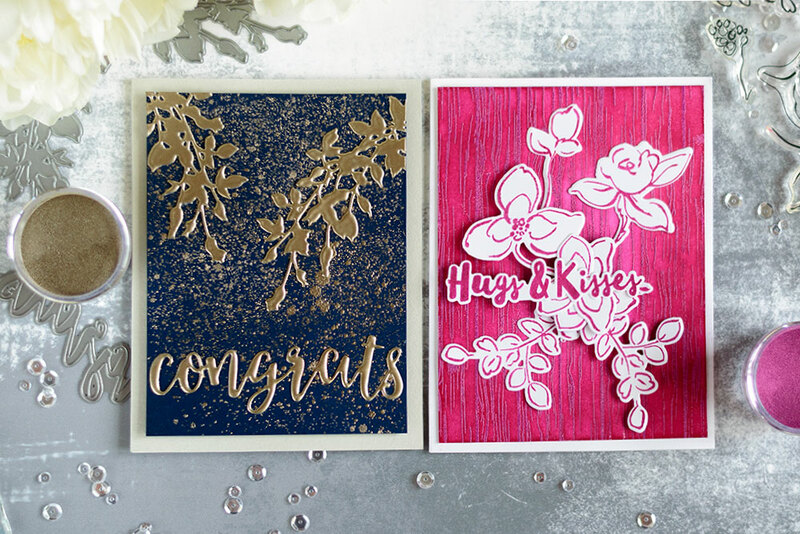 Beautiful cards and love that embossing powder! I love how you used both embossing powders. Those new colors are gorgeous! Thanks for sharing! Wow super gorgeous cards! Thanks for sharing! Beautiful cards! The platinum embossing is gorgeous! Both cards are unbelievably gorgeous.. love the embossing background on the both but the pink one is totally me .. i loved seeing your creation. lovely card ideas. Love these new embossing colors! I love your berry colored wood grain card! Gorgeous! Love the cards, I am obsessed with embossing and I think you did a great job. You must have embossed several coats to get it they way it looks. Well done thanks for the inspiration.